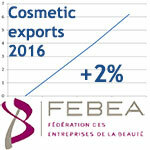 According to the figures released by the FEBEA (French Federation of Beauty Companies), French exports of cosmetic products passed the 12 billion euro mark for the first time in 2016, with a 2% growth compared to 2015. The trade balance surplus in the cosmetics industry reached 9.2 billion euros, which means cosmetics are now ranked second after aeronautics. Germany, the United Kingdom, Spain, and Italy all remain in the Top 5 of the countries to which France exports the most, although the amount of exports tends to slow down a little in these four countries. However, the dynamism in North America and Asia offsets the European slowdown, as can be seen with the sustained growth in North America: exports have risen to the United States (+8.5%), Canada (+4.5%), and Mexico (+4%). The Asian area as a whole recorded a growth of almost 10% in 2016, with rises to China (+15%), Singapore (+13%), South Korea (+18%), and Japan (+4%). As a matter of fact, if Asia had known a more difficult year in 2015, there was a real recovery throughout the region in 2016. And growth remains strong in China, even though regulations are ill-adapted to the constant innovations on this market. Today, Asia represents 17% of cosmetic product exports. ‘French cosmetics still exert an influence all around the world, by combining the strengths of a high quality image and innovation,’ according to Patrick O’Quin, FEBEA’s President. By contrast, there is a real decline in exports to Latin America (-7.2%), the European countries outside the European Union (-3.5%) and the Middle East (-5.9%). Exports to the European countries outside the European Union have been decreasing for several years. The Russian Rouble is an unstable currency, which strongly impacts our exports to Russia (-13%). Declines to the Middle East (Saudi Arabia, -18%, United Arab Emirates, -5.8%) are related to changing, increasingly more complex regulations and to a transitional economy due to the drop in oil prices. Emiratis’ and Saudi Arabians’ purchasing power is declining, which has significant consequences on their consumption of luxury products. Exports to North Africa have decreased by 3.6%: Egypt is the main cause for this decline, with a drop in exports of -27%. Again, it is due to the country’s very difficult economic situation. Skincare and perfumes represent three quarters of French cosmetics exports (43.4% for skincare, 31.3% for perfumes). ‘High-end brands are still popular throughout the world, and pharmacy brands have been entering markets faster,’ emphasizes Virginie d’Enfert, FEBEA’s VP Economic, Environmental, and International Affairs. Lastly, French cosmetics stand out with new transformation features which can explain their success, in addition to product quality: the game considerably changes with an increased vocation for wellness, innovation in distribution methods, and investment in science and technologies. ‘Industry players endeavour to create personal and collective wellness for people to take care both of themselves and the environment. They set up new online distribution strategies and open new physical points of sale, for example by multiplying wholly-owned stores. Besides, companies have been developing the market of personalized, connected, and technological cosmetics, which paves the way for a new era,’ Patrick O’Quin concludes.